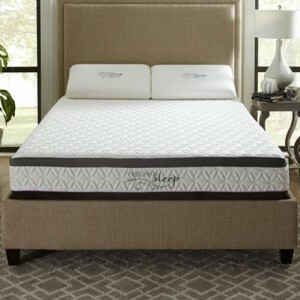 12.5″ Crystal Gel Memory Foam Mattress – Our exclusive Gel Air Memory Foam is a special process infusing Air into the foam resulting in more open cells, more loft and plushness, and practically eliminating heat build-up. The multi-layered design creates sleeping perfection. The 2” Gel comfort layer is aerated to enhance the Air layers ability to contour and breath. The second layer features 2”of Aerated Gel Infused Memory Foam utilizing Nature’s Sleep proprietary (SGT) Superior Gel Technology. The support layer has 8.5” of Xrta high density support foam as its core for nearly perfect progressive support and comfort. The 550 high gram weight cover with a mess border which allows air to pass thru the mattress whisking away even the slightest of heat or moisture build up. The zippered cover is made of a Viscose/Poly/Spandex Blend and can be removed and washed.